kolaleph January 29, 2013 General Interest, Poetry, Piyyutim and Prayers, The Rabbi Is In! Today we read from Va’era, a parsha that contains a new revelation of God’s name and many promises by God of how the Israelites will be redeemed. I am drawn to parts of this parsha that I believe hold redemptive teachings. These surprisingly, are the verses that describe the first seven plagues. These passages cannot be read literally in my view, especially the verses that declare that God will harden Pharaoh’s heart in order that God can impress both Egyptians and Israelites with His power. A literal reading of these texts could lead us to a distorted view of G-d, as needing recognition, rather than us needing to recognize how we are supposed to live on this earth. One of the questions raised by these passages considers whether we should ever wish for plagues upon our enemies. I believe the answer is “no”. And yet- plagues surely exist now as they did in ancient times. So for me, first of all this passage is descriptive, accurately depicting what happens when we do not live in awe of the holiness of all life. The Egyptian system based upon slavery, thus obliterating the spark of divinity in each human being. It was also true that Pharaoh was viewed and viewed himself as Divine. I think this passage is meant to provoke discomfort and to prod us into asking , “Is this REALLY what it takes to get us to change?”. Rabbi Harold Kushner answers, ‘yes’, writing, “The situation for both the Egyptians and the Israelites must become unbearable to overcome the tendency of both sides to maintain the status quo. But we need to go deeper and ask a more fundamental question: “What is a plague?”. In my view, plagues are wake-up calls. They show us what happens when our actions run counter to the Divine flow of the universe. Here is a list of seven plagues we have seen in our own time, (and I am sure you all could add your own to this list): melting of the polar ice-caps, a winter of no snow in Vermont, Hurricanes Katrina and Sandy, oil spills in the Gulf of Mexico and in the artic, the extinction of species in the tropical rainforests, suffocating algae growths in the Chesapeake Bay, droughts in Ethiopia and Somalia. All of these phenomena are connected to our disregard for the holiness of G-d’s creation. And the Pharaoh’s of our time, those who hold immense power, do not see the connections, just as the ancient Pharaoh did not see the connections between the plagues of his time, stubbornly thinking each was a “coincidence”. Not only do those who hold power fail to see the connections, they often isolate themselves with their wealth and privilege, behaving exactly as Pharaoh does when confronted by the Nile turning to blood, “Pharaoh turned and went into his palace, paying no regard even to this” ( Ex. 7:22) . While I began by saying we should not wish plagues upon our enemies, it does seem as if we need SOMETHING to shake us out of our complacency. As Frederick Douglas teaches, “Those who profess to favor freedom, and yet deprecate agitation, want crops without plowing up the ground- they want rain without thunder and lightning- they want the ocean without the awful roar of its waters”. And I support agitation. However, it seems too easy to blame all the environmental disasters on others. We also have our internal Pharaohs. Many of us live pretty privileged lives that allow us to turn and go into our palaces, rather than work for change. Do we harden our own hearts and in the words of Rabbi Shefa Gold, “…get used to the world in its imbalance …accomplished by denying any feelings that might threaten the status quo”? A status quo that we benefit from in the short term. Or, we may suffer from the kind of self-righteousness that pushes people away, rather than being able to draw them into a common alliance of survival. We may be so angry that we fail to see the divinity in our opponents and therefore lose the ability to instruct rather than threaten. Rashi teaches that “Because the river protected Moshe when he was cast into it, therefore it was not smitten by his hand, neither at the plague of the blood nor the plague of the frogs”. Moshe was able to honor the life-giving water. As we honor all life, even the lives of those “who are part of the problem”, we may find that fewer disasters are “necessary”. “Here is the true meaning and value of compassion and nonviolence: when it helps us to see the enemy’s point of view, to hear his questions, to know his assessment of ourselves. For from his view we may indeed see the basic weaknesses of our own condition, and if we are mature, we may learn and grow and profit from the wisdom of the brothers who are called the opposition”. We cannot place our hope in the threat of disasters to change people. Our situation is already unbearable enough. People tend to react as Pharaoh did to disaster, ie, repent for the moment and return to their previous ways the minute the immediate threat has passed. For long term change, I believe that the redemptive teaching of this parsha is that we, especially those of us who attempt to be spiritual leaders, must reach for all with love. Rain Zohav is approaching senior status as an Aleph Rabbinic student and finishing her Master’s Thesis in Jewish studies at Gratz College (online program). She is currently works as both the Principal of Kehila Chadasha Sunday School and Director of Education at Shirat HaNefesh Shabbat School. She has been directing supplementary Jewish schools for 18 (Chai !) years, developing curriculum in many areas including Tikkun Olam and Torah and is also a lifelong activist on a range of progressive issues. Lieber, David L., and Jules Harlow. Etz Hayim: Torah and commentary. Philadelphia: Jewish Publication Society, 2001. Plaut, W. Gunther, Bernard J. Bamberger, and William W. Hallo. [Torah] = The Torah : a modern commentary. New York: Union of American Hebrew Congregations, 1981. Gold, Shefa. 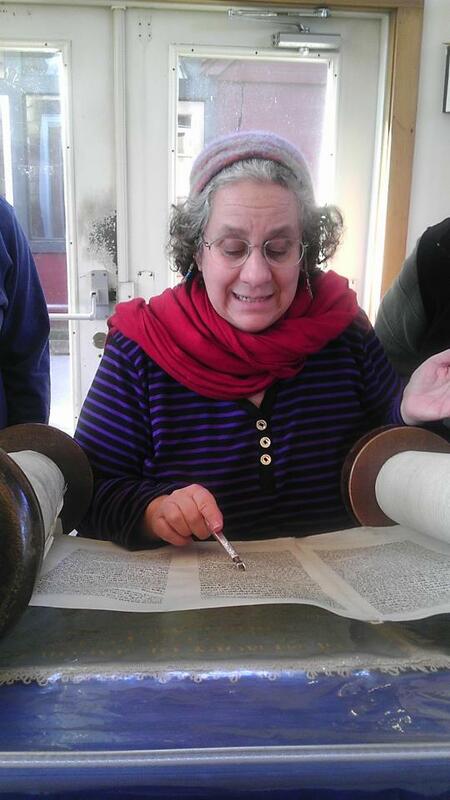 Torah journeys: an inner path to the promised land. Teaneck, NJ: Ben Yehuda Press, 2006. Posted in General Interest, Poetry, Piyyutim and Prayers, The Rabbi Is In!. Bookmark the permalink.